Each "cell" is made up of one of these transistors. 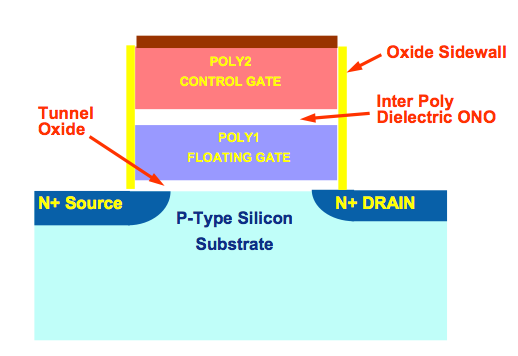 In a single-level cell (SLC) flash device, one of these transistors can hold 1-bit of data. You write data to the cell by electron tunneling; apply a high enough voltage to the gate, create a powerful enough electric field, and electrons will tunnel through the oxide and into the floating gate. Remove the voltage and the electrons will remain in the floating gate. Apply the voltage across the channel instead of the gate, reverse the bias and the electrons will go in the other direction. Simply put, that's how flash works - you've got two states, 0 and 1, and the state is preserved even if the cell has no power, making it ideal for a storage device. Programming flash is an iterative process. The controller will apply voltage to the gate (or the channel), allow some electrons to tunnel and check the threshold voltage of the cell. When the threshold voltage has reached some predetermined value, it’s now programmed and your data is stored. Erasing performance is the same between the two, read performance takes twice as long on MLC flash and write performance can take almost four times as long. If you've ever heard people complain about MLC write speed before, this partly why. Do keep in mind though, the numbers we're talking about here are ridiculously low - even 900 µs to write to MLC flash is much faster than writing to a mechanical hard disk. The biggest advantage of SLC ends up not being performance, but lifespan. To understand how flash wears, we first need to look at how it's organized in a storage device.